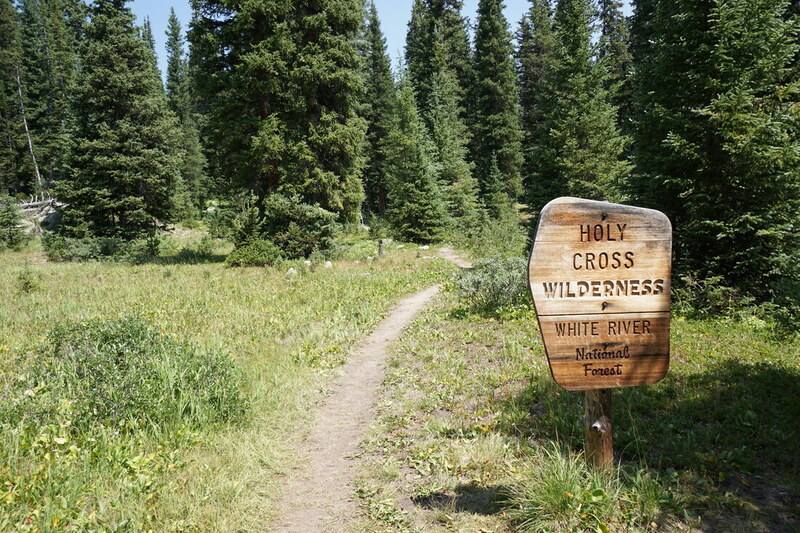 DIRECTIONS: From Sedalia, CO, take Route 67 west for 10 miles to the Indian Creek Campground. Continue on 67 west for another 1.7 miles and look for the sign for the Columbine Public Archery Range. 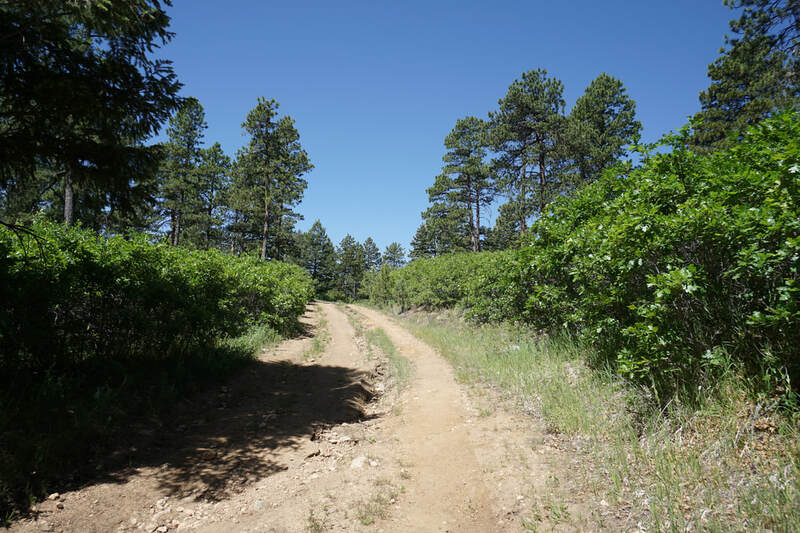 Turn right onto the narrow, but well maintained, dirt road. 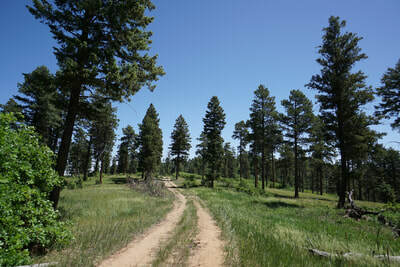 After .4 miles the road will end at a large parking area. 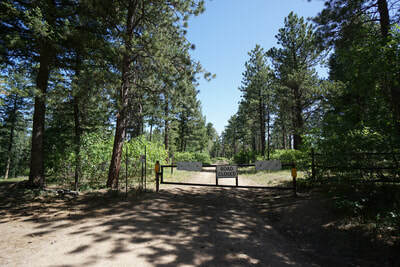 The gate and trailhead for the Archery Range is at the southern end of the parking area, the gate and trailhead for Russel Ridge (unsigned) is at the northern end of the parking area. 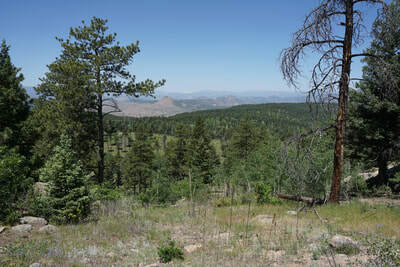 Bennett Mountain sits along the eastern edge of Russel Ridge which runs parallel and west of the Rampart Range and Indian Creek Trail Systems. The trail consists of an old road, now closed to motor vehicle use, and travels through pine and aspen forests. 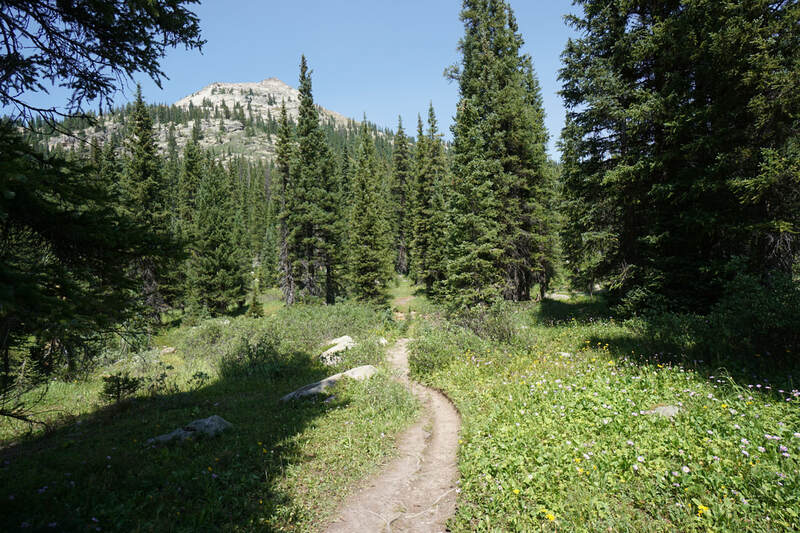 The trail is seldom used, quiet, and peaceful. 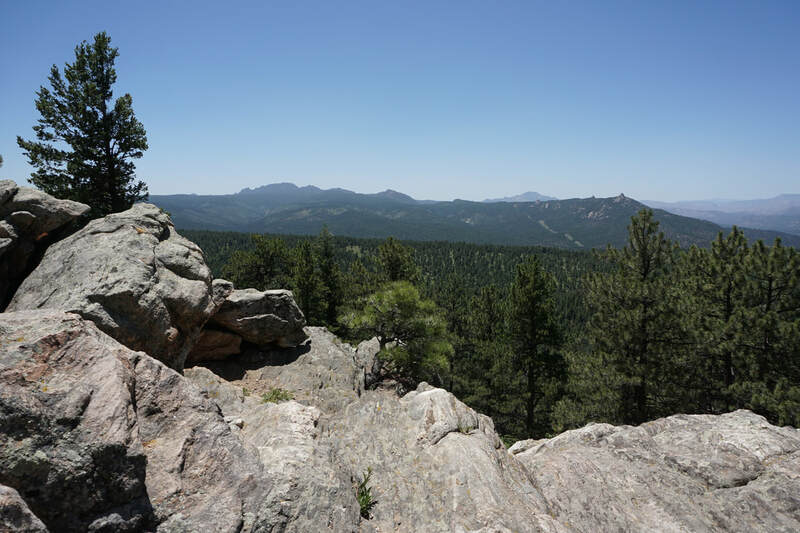 Bennett Mountain provides an opportunity to climb an easy mountain and increase your views of the surrounding iconic rock formations, and peaks. 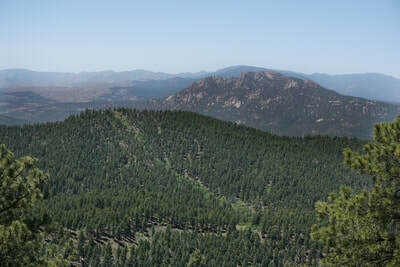 Along the way your views include: Devil's Head, the Noodle Heads, Thunder Butte, Long Scraggy Peak, Raleigh Peak, the Cathedral Spires, and the Mt. 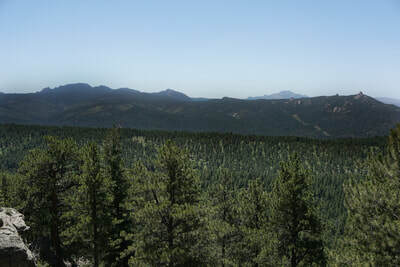 Evans massif. 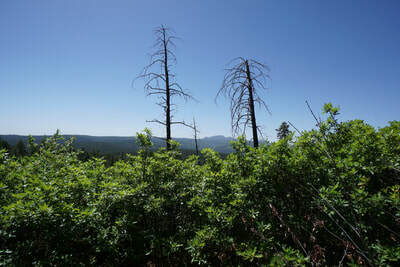 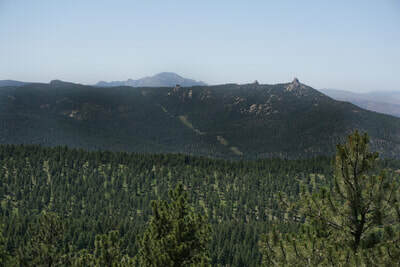 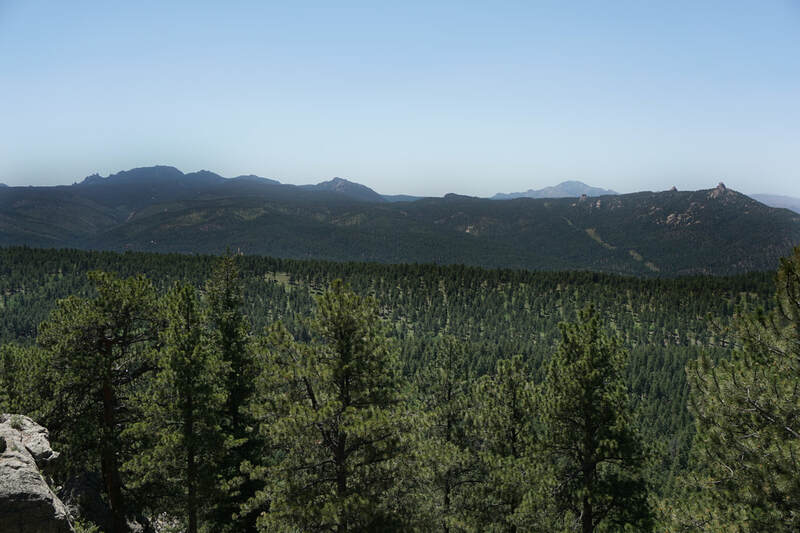 You can also see further away peaks along the continental divide though on my visit there were fires in S.W. 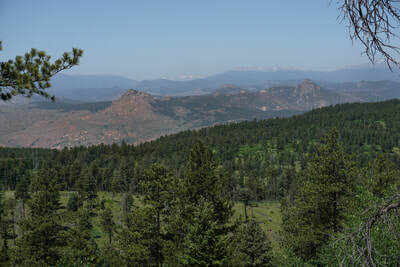 Colorado that increased the haze and decreased the views. 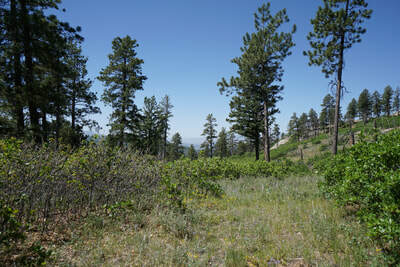 From the parking area, follow the gated road on the north side of the parking area (Russel Ridge Trail). 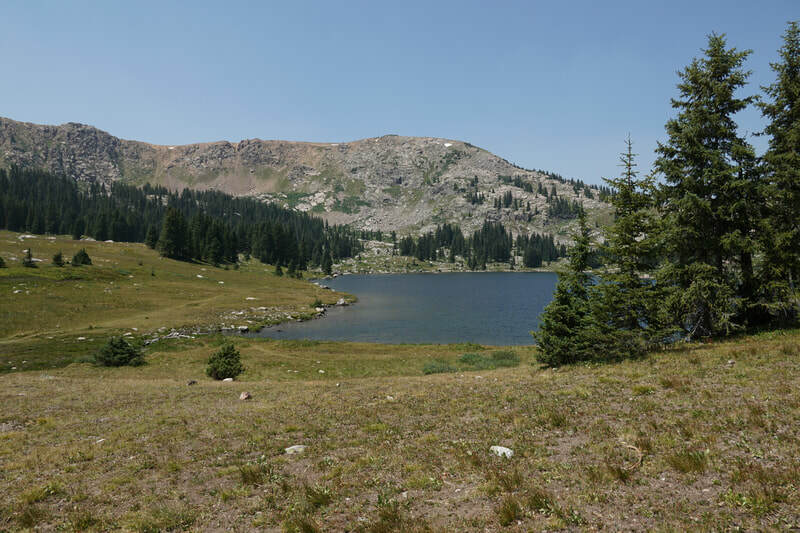 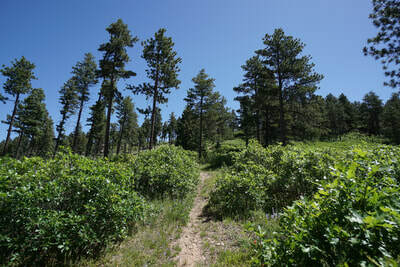 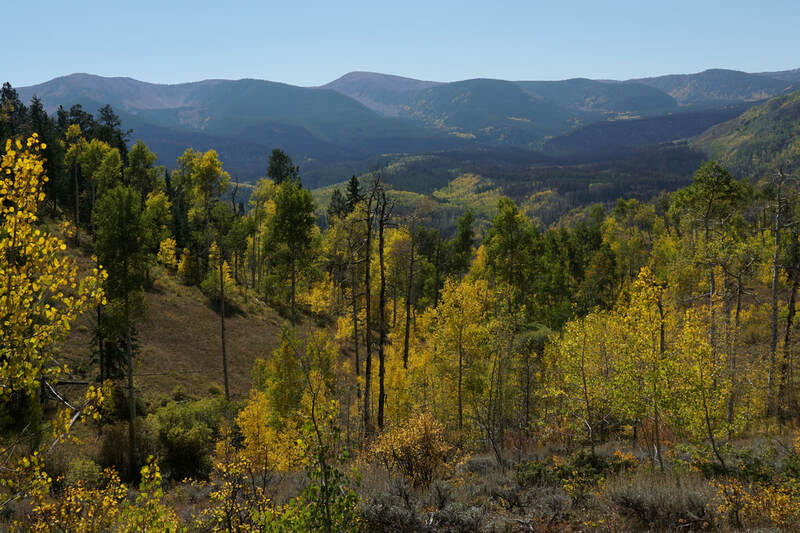 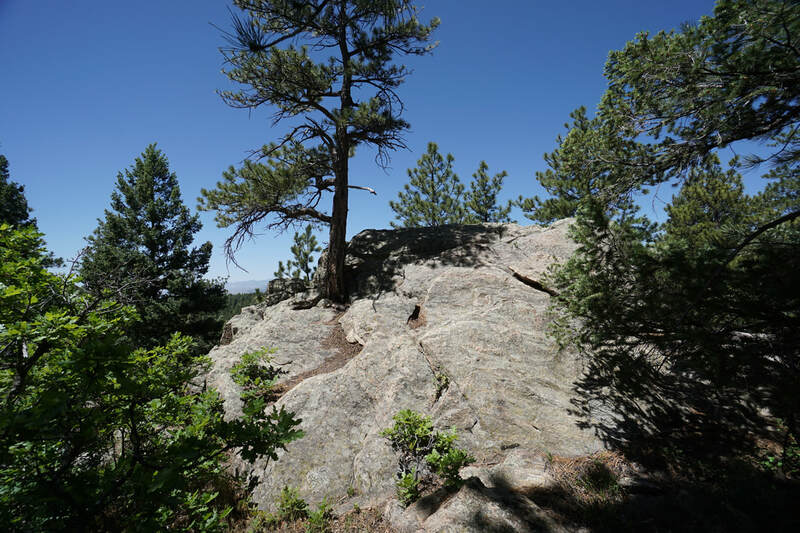 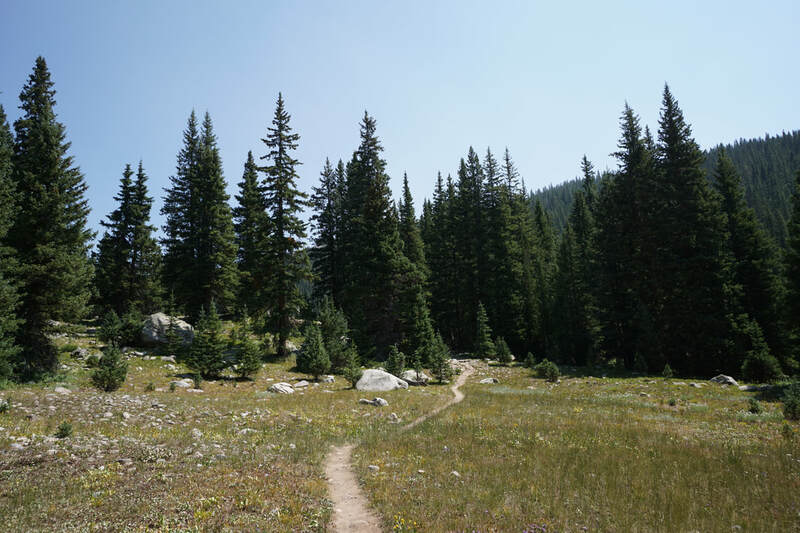 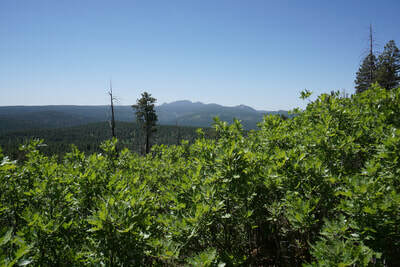 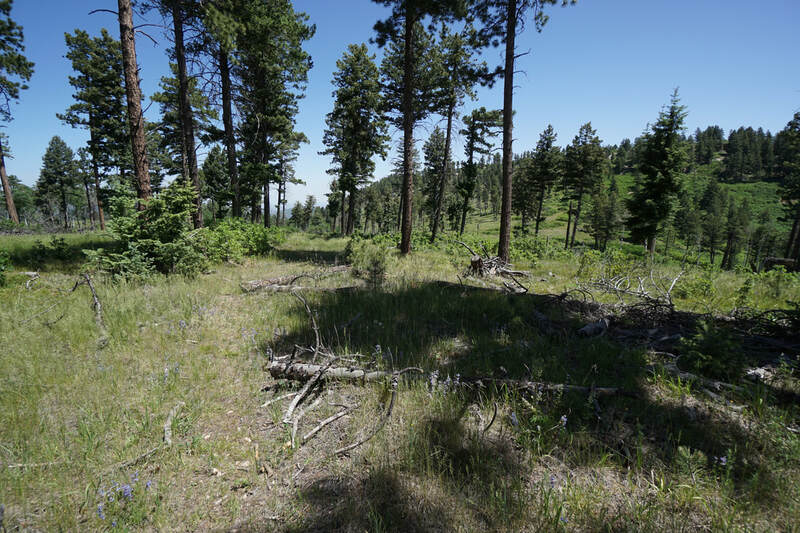 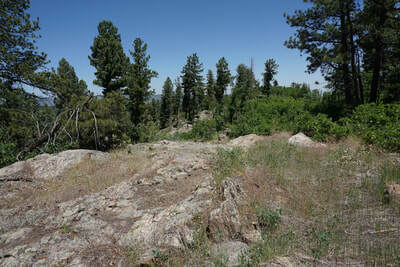 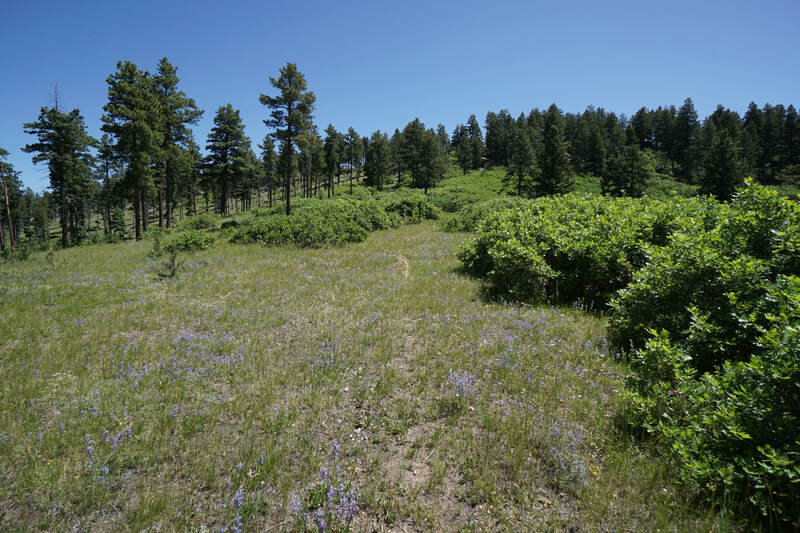 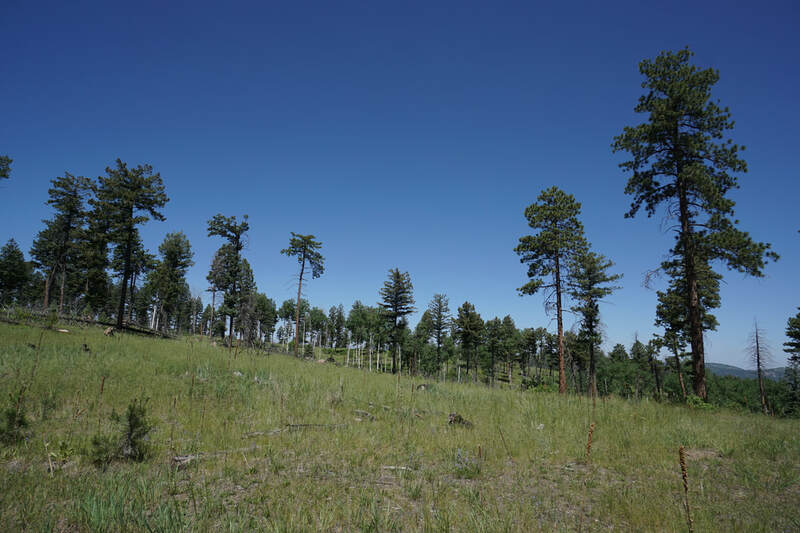 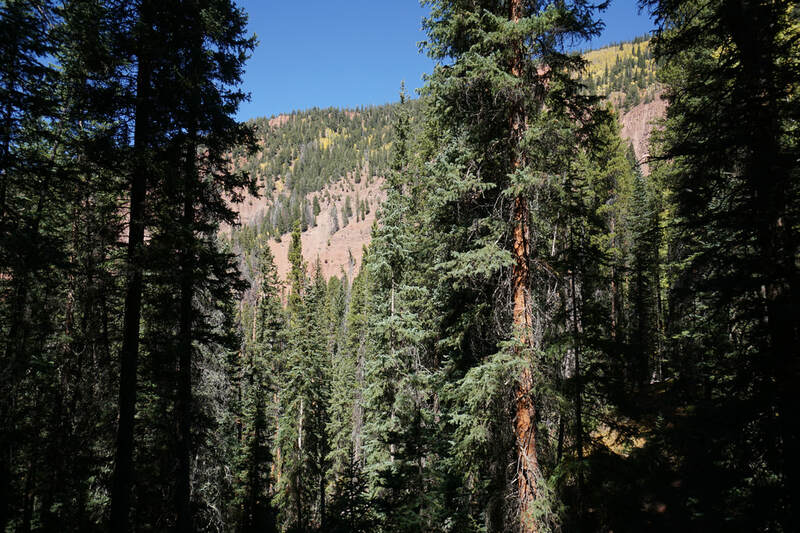 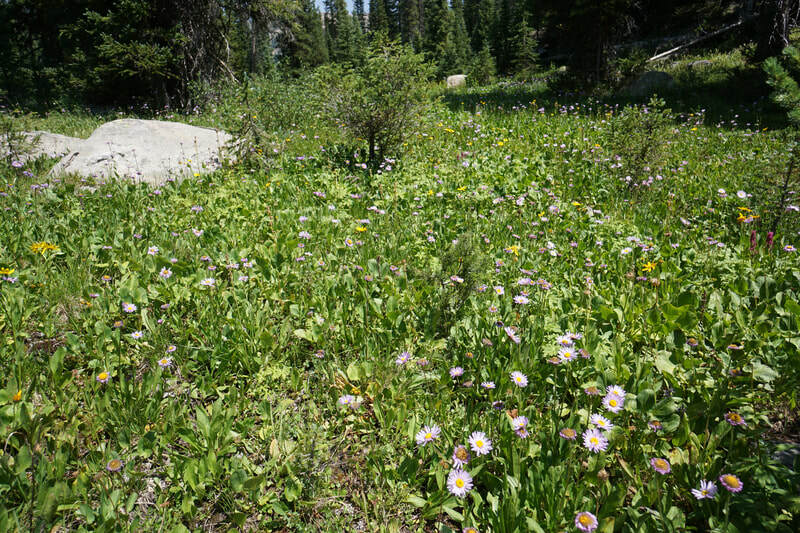 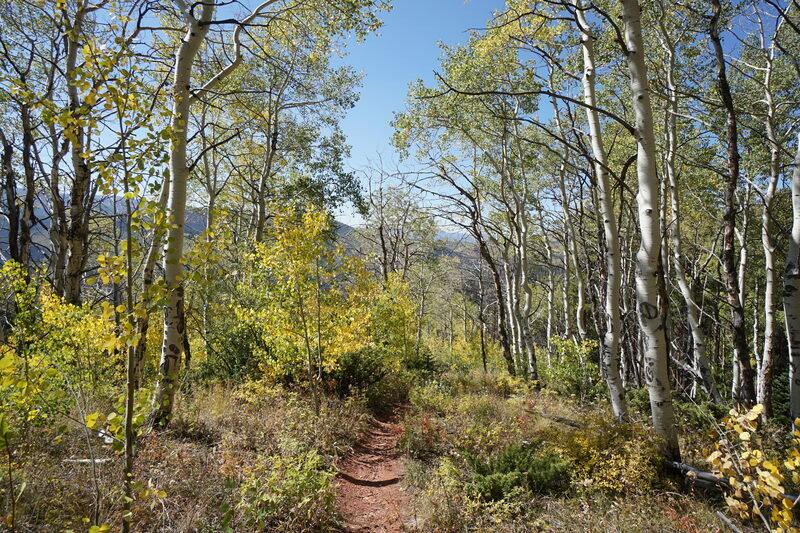 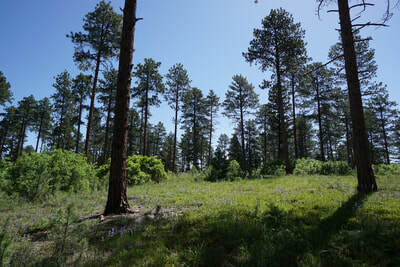 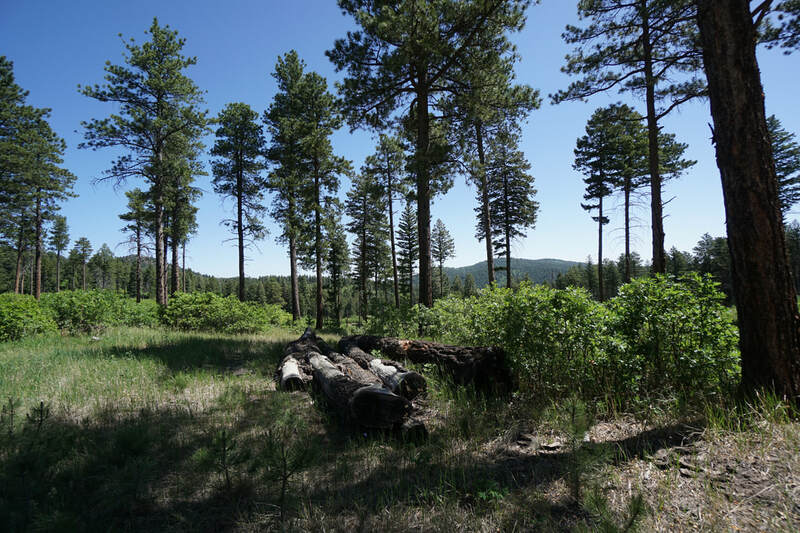 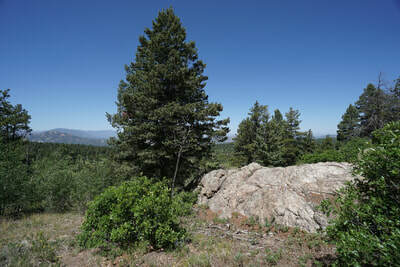 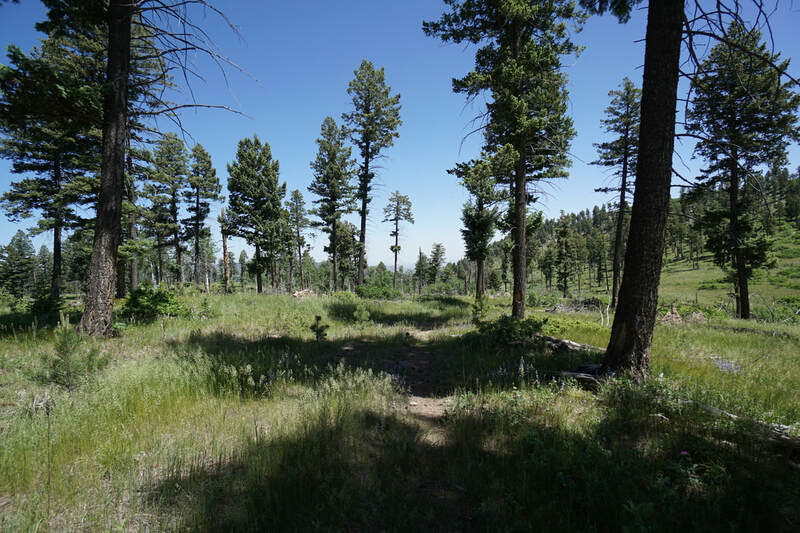 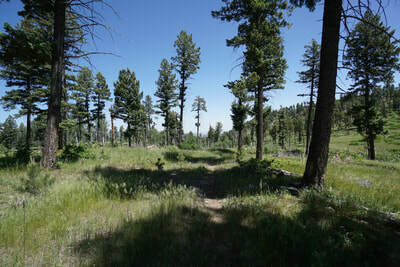 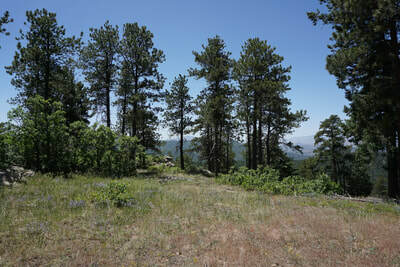 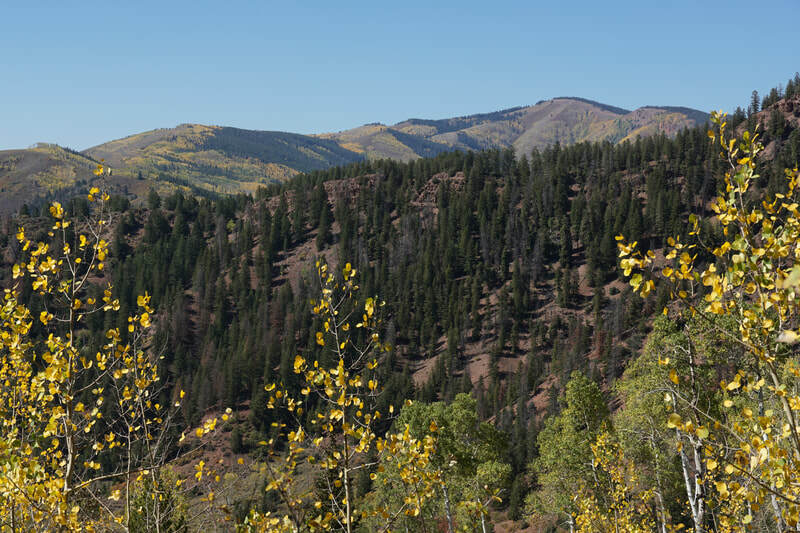 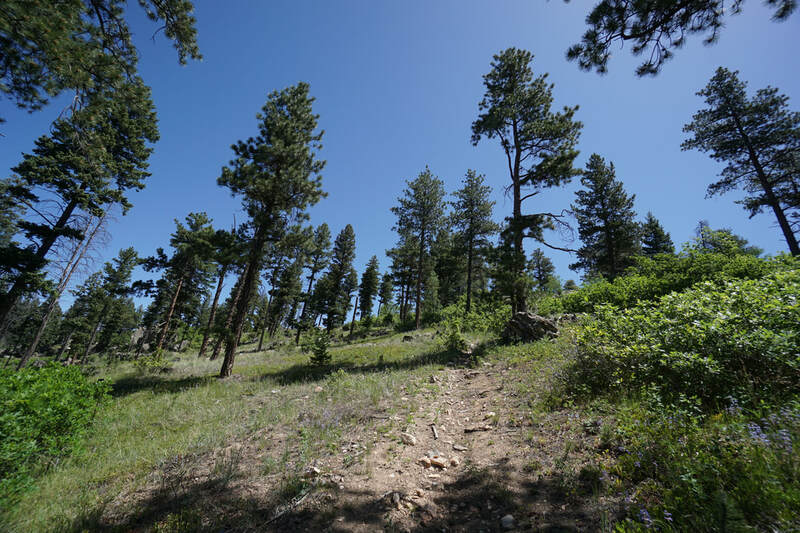 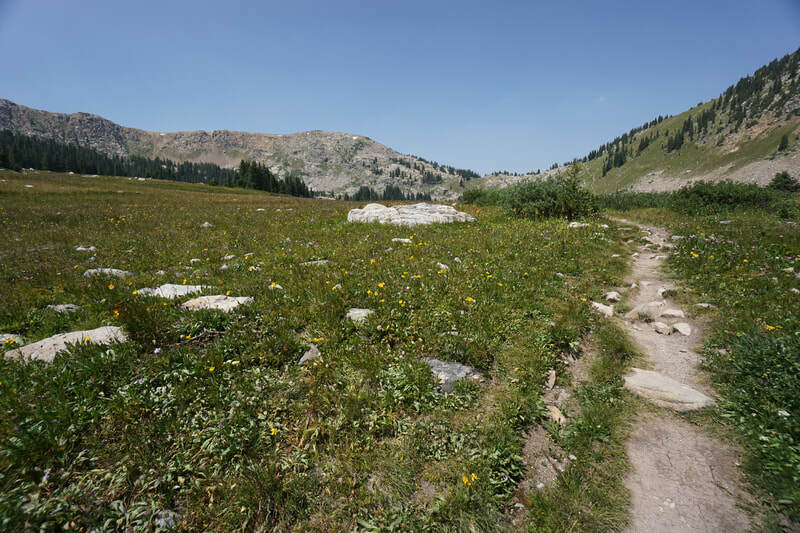 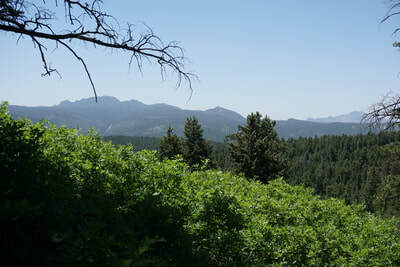 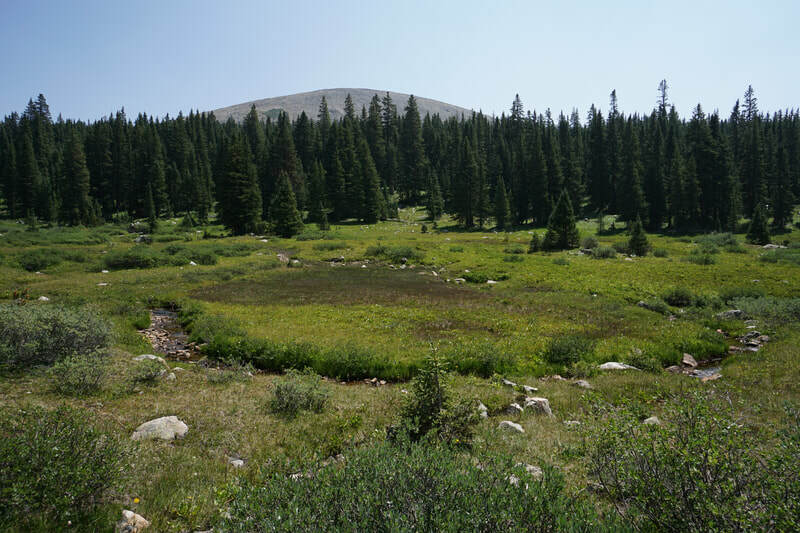 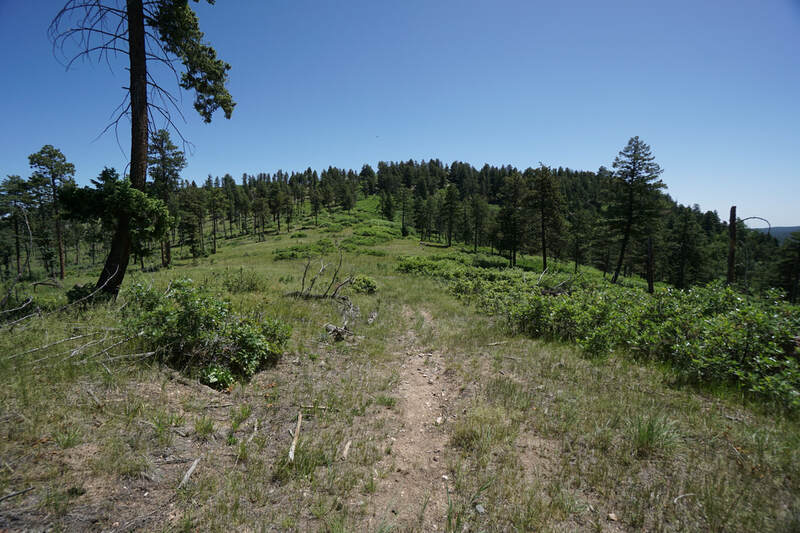 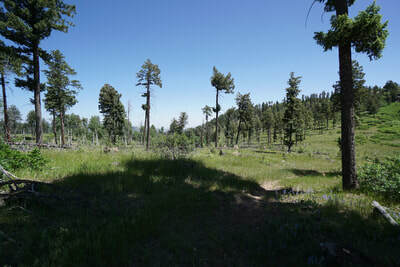 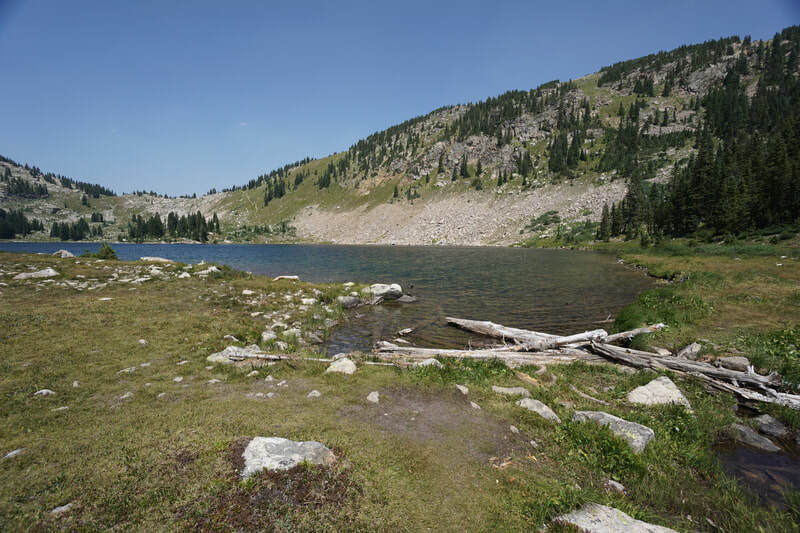 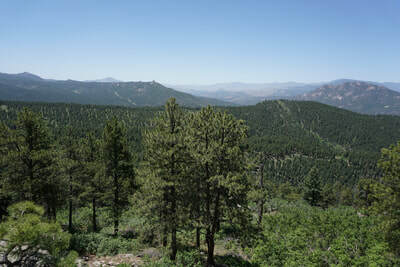 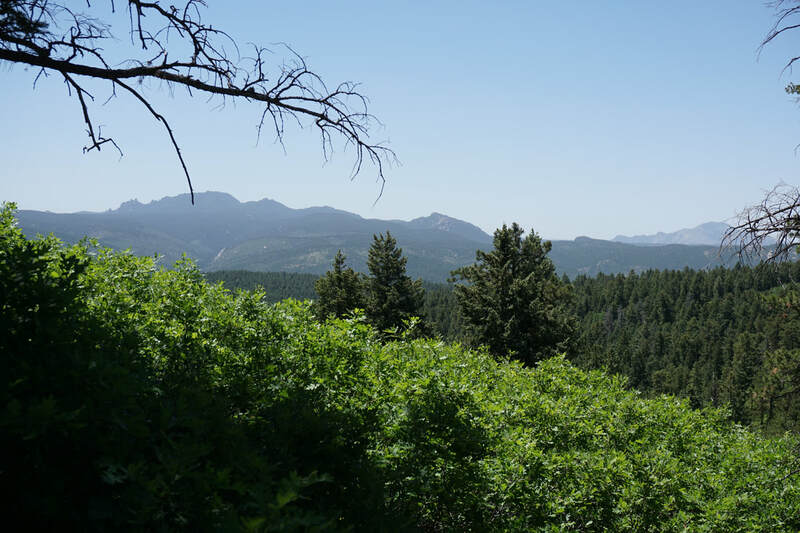 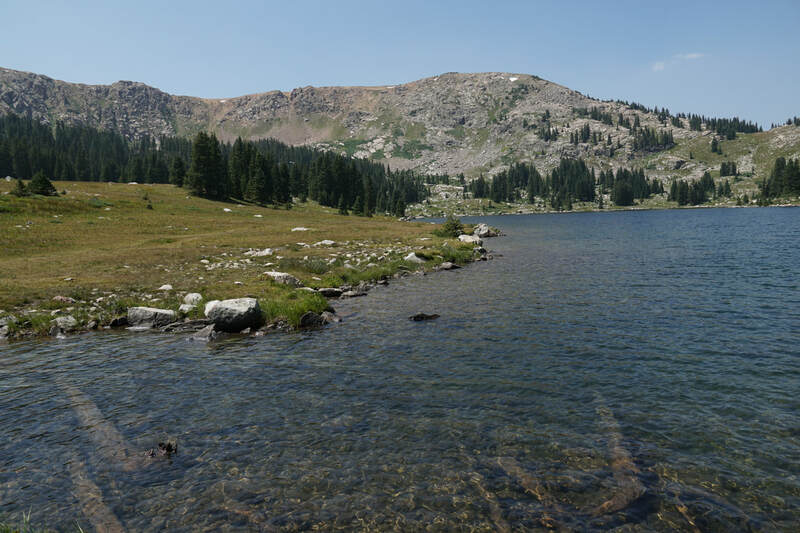 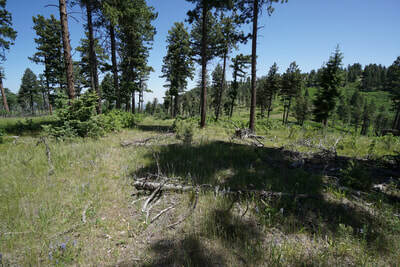 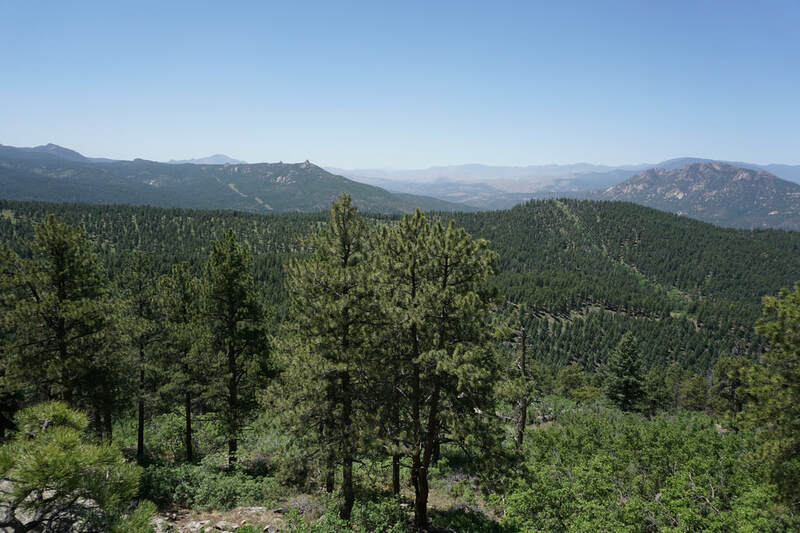 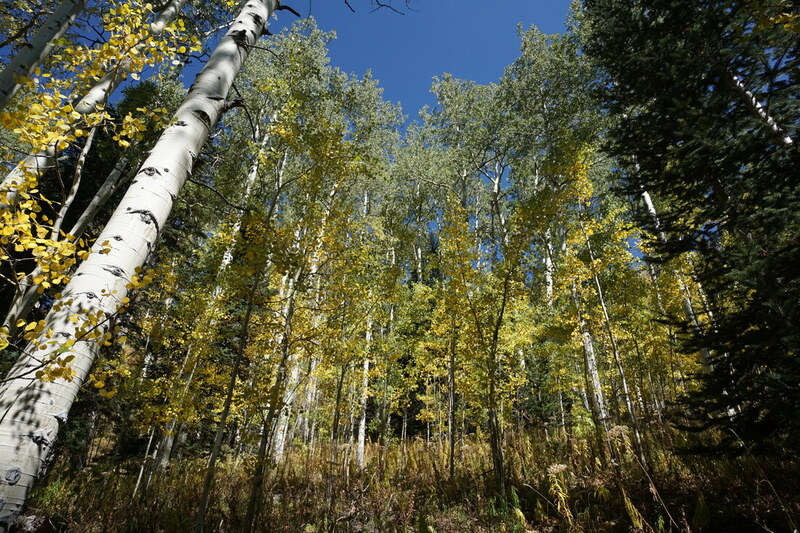 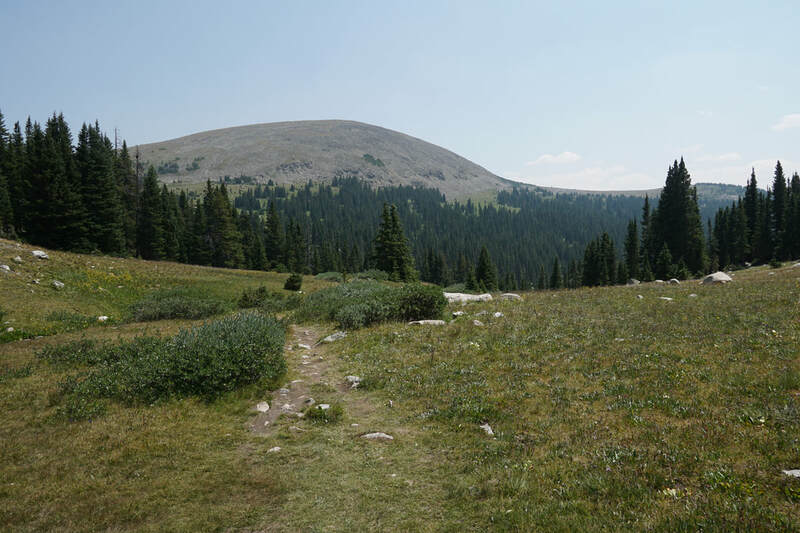 The first portion of the trail travels through tall pines with frequent wildflowers and aspen groves. 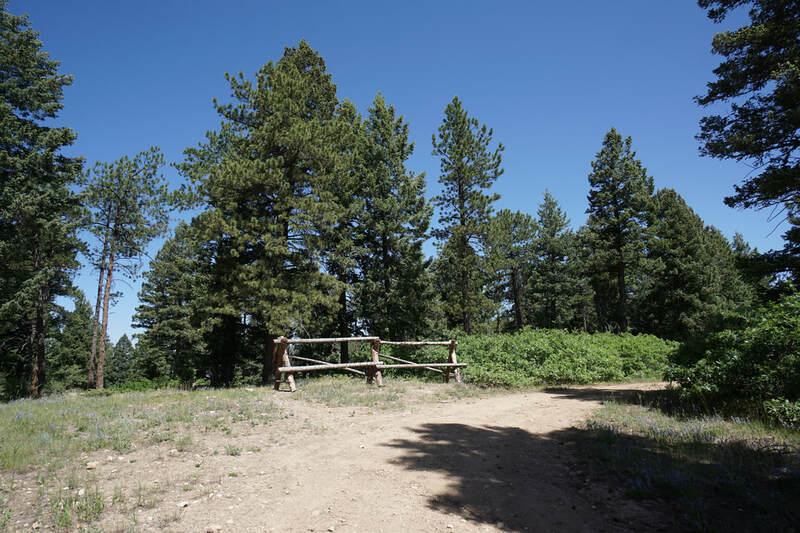 The trail climbs to a wooden fence on the western side of the road. 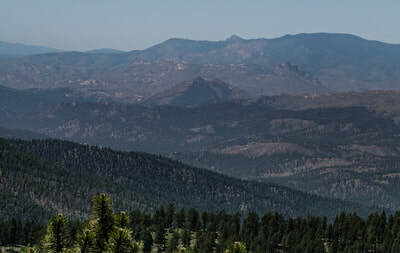 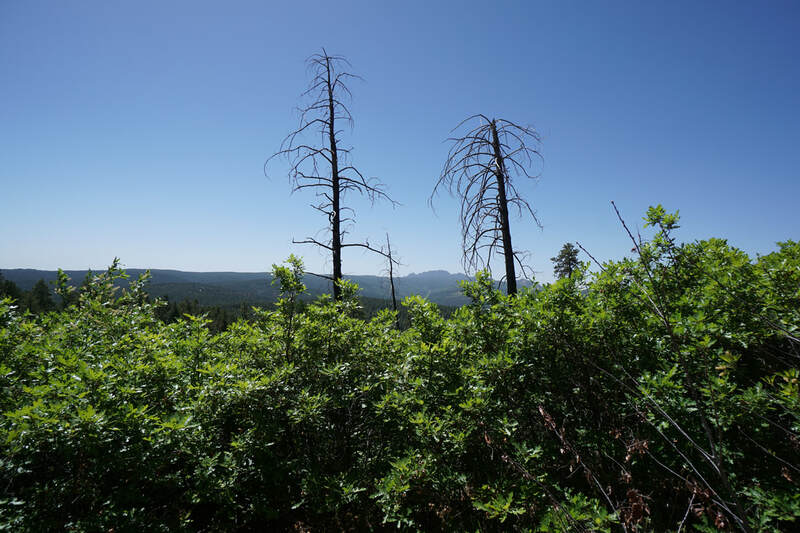 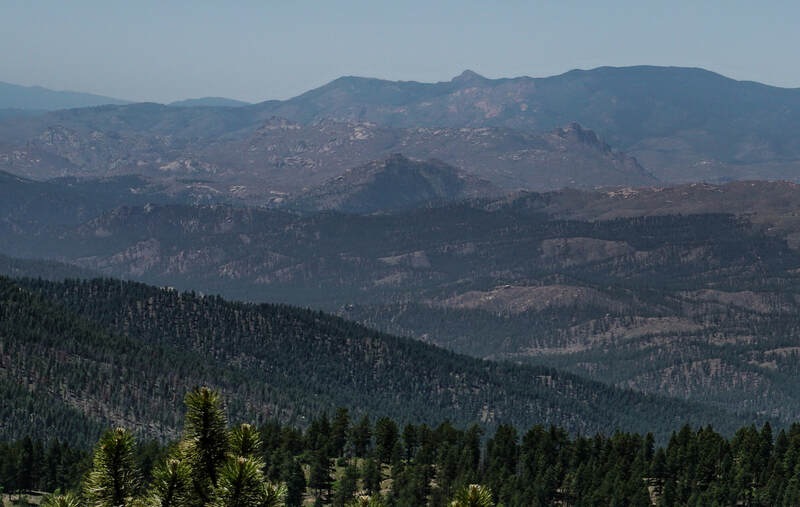 Explore this area for some amazing southern and western views of Devil's Head, the Hayman Fire Burn Area, and Long Scraggy Peak. Continuing along the trail you'll soon pass a spur road on your left and come to a curve in the road with 2 trail signs. 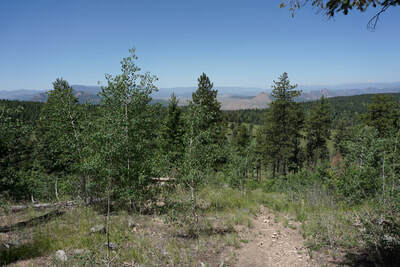 This is where you leave the Russel Ridge Trail to reach Bennett Mountain. 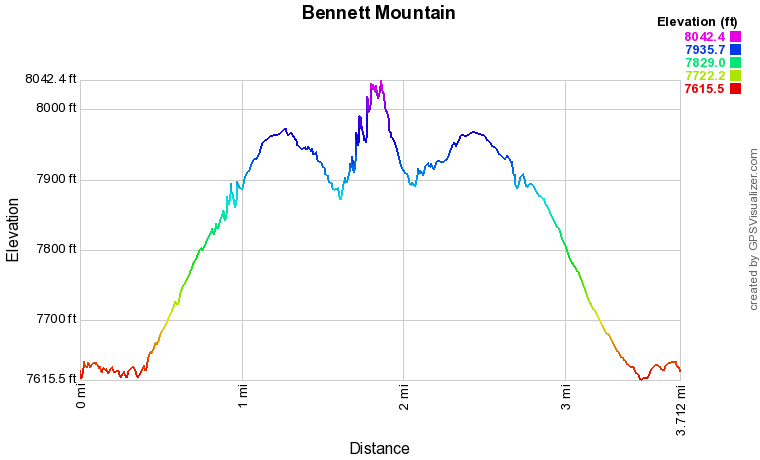 Find the square "no motor vehicles" sign and head due east towards Bennett Mountain, if you don't see the faint trail at first, don't worry it will become evident soon. 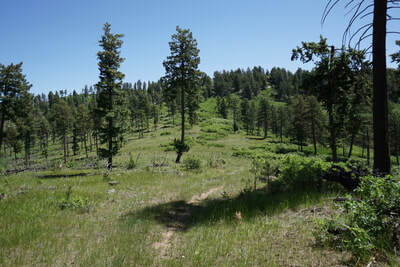 The trail fades in and out but is generally easy to follow all the way to the top of Bennett Mountain. At the top of the mountain is small wooden bench and faint trails leading north and south. Explore both ways to find the best views. 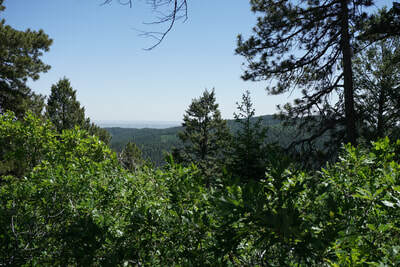 Most of the summit is forested so you need to work for the views. 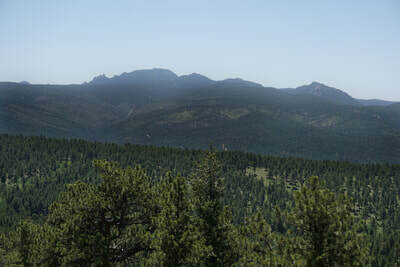 Not far from the bench are some good views down to Raleigh Peak and the Cathedral Spires with Mount Logan, Rosalie Peak, and Mt. 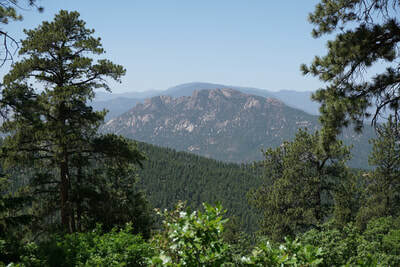 Evans looming in the distance. A group of tall rock boulders and towers at the southern point of the mountain is your best bet for views, if you can find your way there. Retrace your steps back to the Russel Ridge Trail for your return.